The Boston Police Department’s Mobile Operations Division contains specialized units for emergencies beyond the capability of neighborhood police stations. These units include motorcycle and mounted patrols, harbor police, the hazardous materials unit, and the canine and bomb squads. 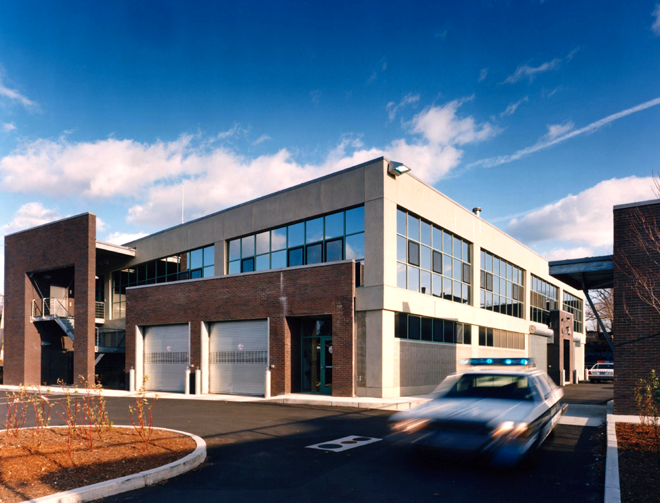 The ground floor includes an armory and a two-bay ambulance garage for an Emergency Medical Service Unit operated by the Department of Health and Hospitals. Upstairs are lockers, offices, meeting rooms, and the Operations Center. The site plan was designed to minimize use by police and emergency vehicles of the surrounding neighborhood’s residential streets. Contractor: Fairview Construction Co., Inc.